All over the world, millennials are coming into their own and Indonesia is no exception. Millennials are a huge segment of the country’s population, comprising more than 50 percent of the Indonesian population as defined by Accenture. 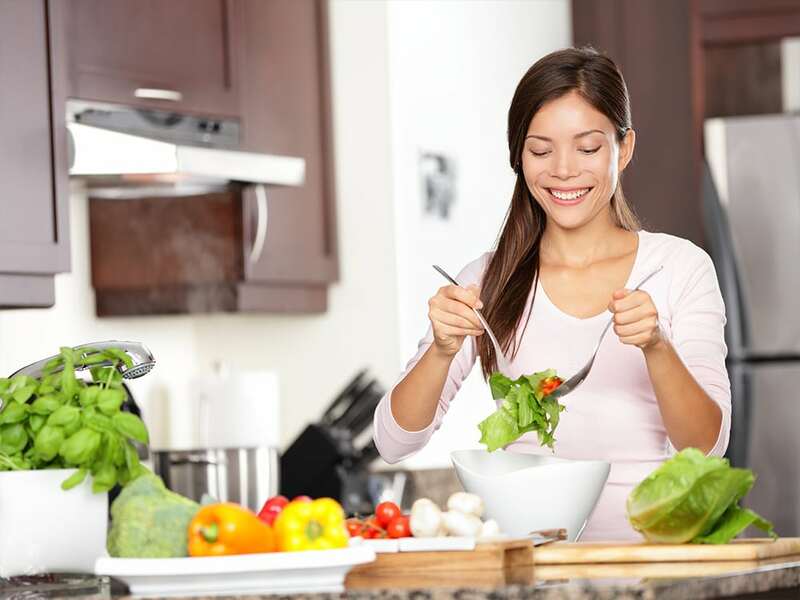 Of these, Alvara Research Institute estimates that by 2020 some 35 million millennials will fall into the middle class segment, is an important demographic for consumption patterns. Indeed, Telstra states that the average Indonesian Millennial’s wallet size (defined as total balance value of deposits and lending held) has already surpassed that of all other demographics in the country. With this in mind, Snapcart, a leading technology company whose services includes market research and analytics, conducted research on the grocery shopping habits of Indonesian Millennials. 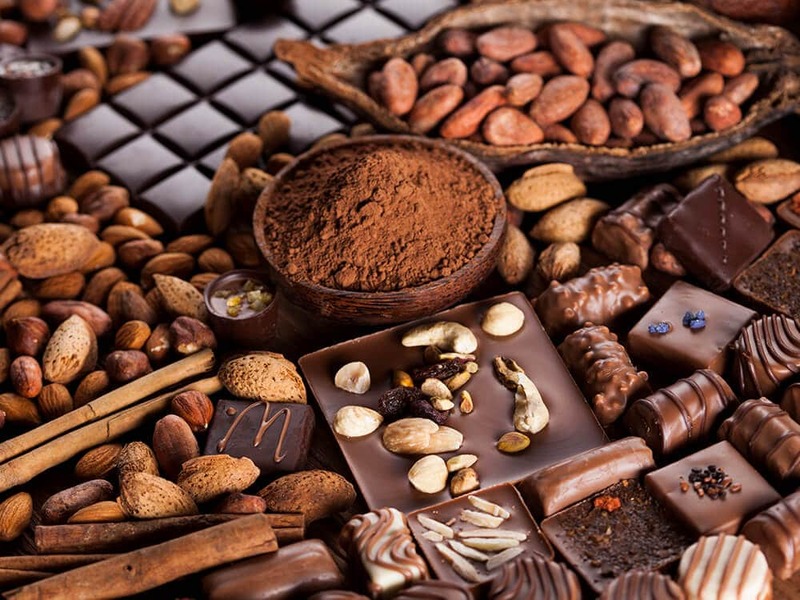 This research was based on 1.3 million transactions in Indonesia, sourced directly from shopping receipt data by Indonesian shoppers from January to December 2017 at more than 6,500 modern trade outlets comprising Hypermarkets, Supermarkets, Minimarkets, Convenience stores, Modern Health and Beauty stores and other Modern Trade independent stores across the nation, including Maluku and Papua. To make this research richer, Snapcart held a survey in April 2018 with Marketeers Magazine which surveyed a total of 9,281 respondents comprising 67% females and 33% males, divided into three generations or age categories: Gen X (36+ years), Millennials or Gen Y (18 – 35 years), and Gen Z (<18 years). 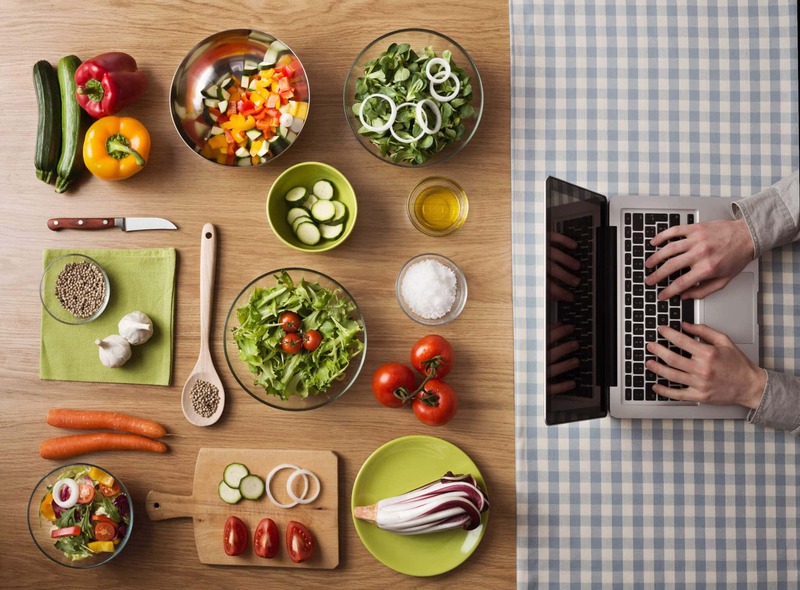 This article discusses the differences in shopping behavior between Millennials and Non-Millennials (Gen X and Gen Z) for both offline grocery shopping and online shopping. Overall, the Snapcart survey showed that minimarkets and supermarkets were the favored channels for daily needs by shoppers of all three generations, possibly because of price considerations in line with findings from the survey that supermarkets and minimarkets are perceived as the lowest price channels. 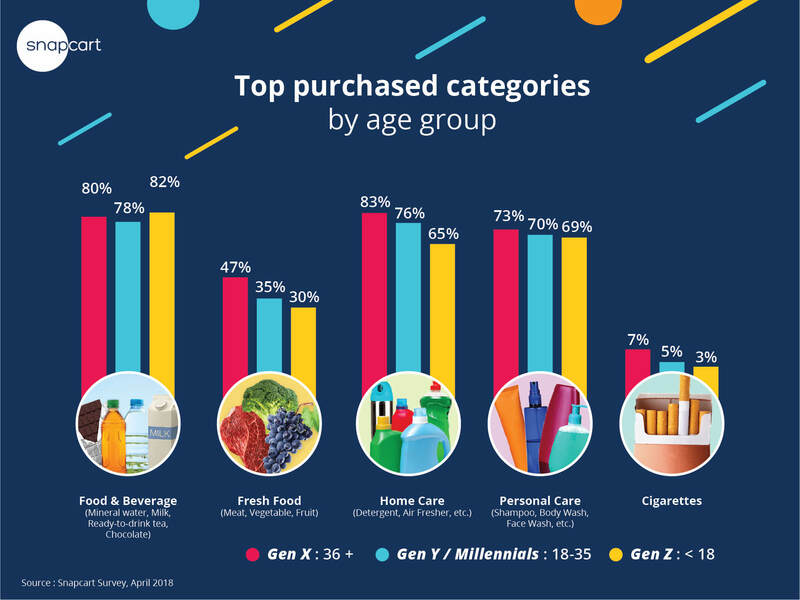 Breaking this down further, supermarkets are perceived as the cheapest channel by Gen X while minimarkets are perceived as the cheapest channel by Gen Z, with Gen Y showing more mixed reactions. The Snapcart survey showed that older respondents, who are more likely to have families, purchased groceries more frequently than younger Gen Z respondents. Specifically, 85% Gen X, 81% Millennials and 75% Gen Z respondents had purchased groceries within the last three months. 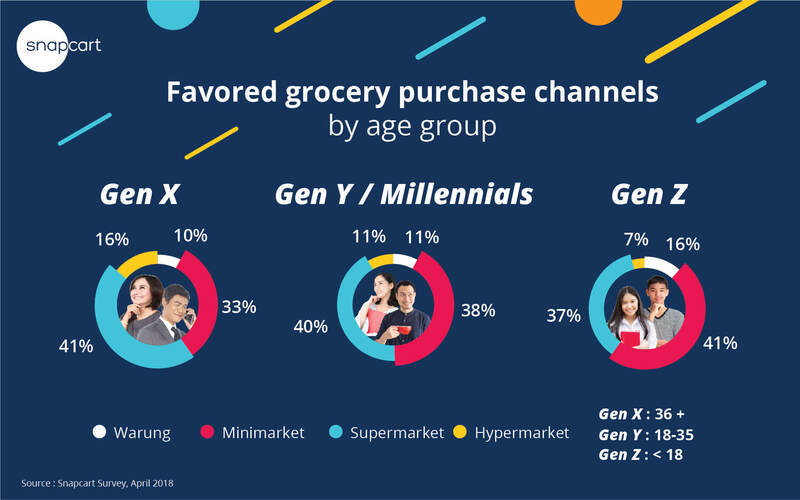 Supermarkets were the favored shopping format for Gen X and Millennials, with 41% and 40% of respondents in these respective categories mentioning that they shopped at supermarkets. Minimarkets were the second most favored shopping format. The rankings for Gen Z were reversed, with minimarkets as the favored category and supermarkets in second place. Gen Z shoppers were least likely to visit Hypermarkets (7%). This makes sense as younger Gen Z seek out perceived convenience, shopping in the form of minimarkets located close by, in contrast to older Gen X who typically have large shopping basket sizes for their families and thus more frequently seek out large format Hypermarkets. The behavior of Millennials, on the other hand, had overlaps with both Gen Z and Gen Z, possibly because the members of this age group are in transition stage and thus vary in lifestyle from students to executives and young parents. 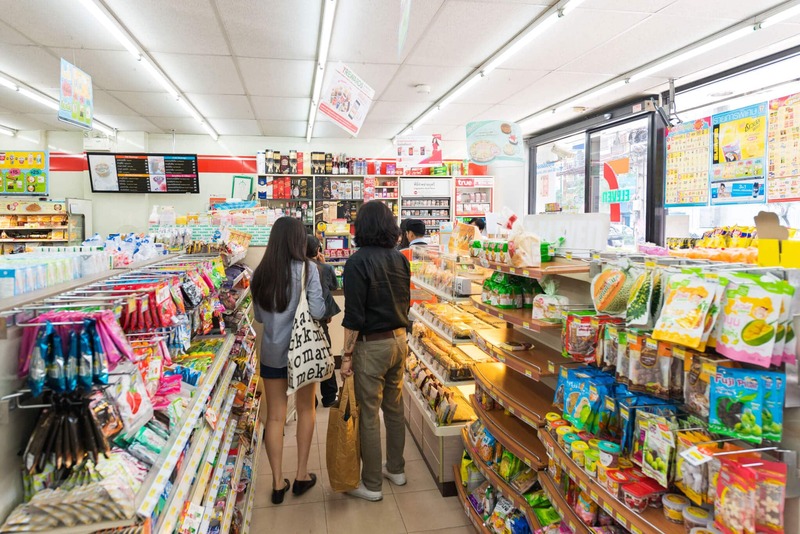 Interestingly, the 2017 receipt data showed that compared to Non-Millennials, the Gen Y Millennials visited minimarkets more frequently, and also tended to purchase discounted items compared to the Non-Millennials. Spending for most categories was highest by Gen X shoppers, including the popular categories of Home Care, Personal Care, Cigarettes and Fresh Food. This makes sense as Gen X shoppers are typically shopping for a larger family size with children included. 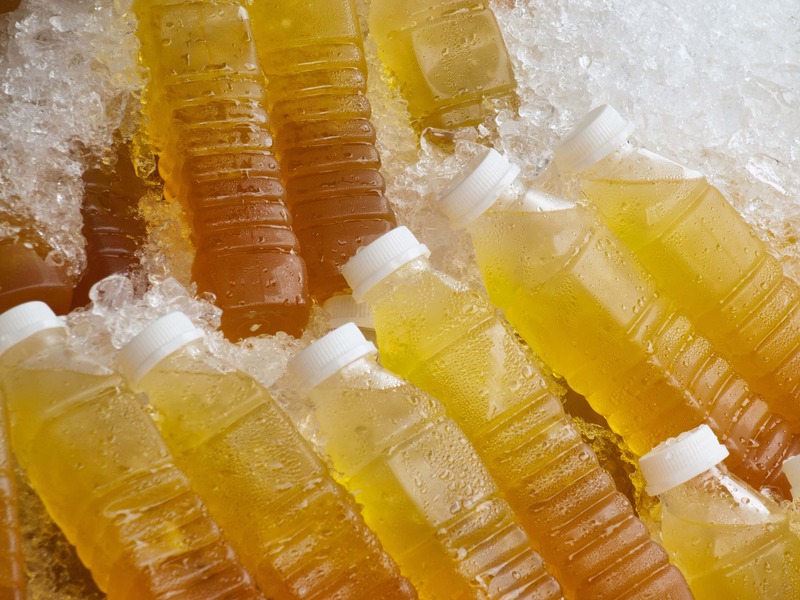 Viewed as a proportion of their spending, The survey showed that a total of 82% Gen Z respondents mentioned that they had made recent F&B purchases (mineral water, milk, RTD tea, snacks, chocolate, etc). From 2017 receipt data, Snapcart found that Millennials most frequently spent on the Food and Beverage category. 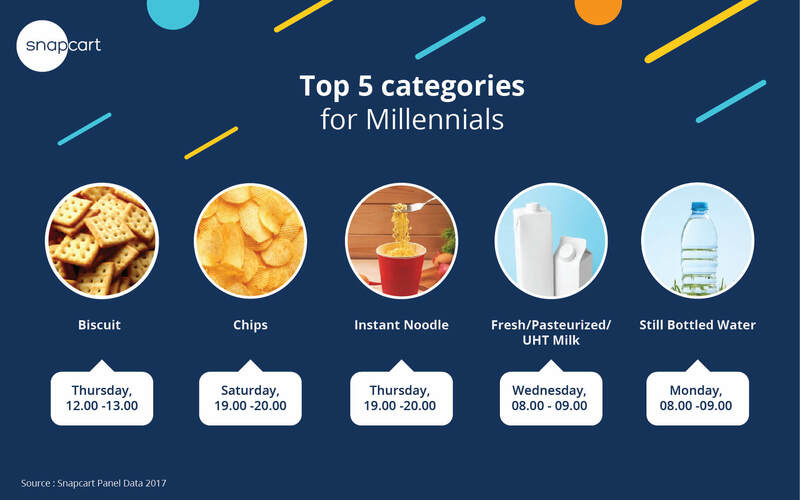 Specifically, Biscuits, Chips, Instant Noodles, Milk and Still Bottled Water were the top 5 purchase categories for Millennials. Chips were purchased most frequently on Saturdays, perhaps for consumption during leisure time with friends or family. Overall, basket size increased with respondent age. Thus, Gen X customers spent the most, followed by Gen Y and finally Gen Z, in accordance with their relative income and spending power. 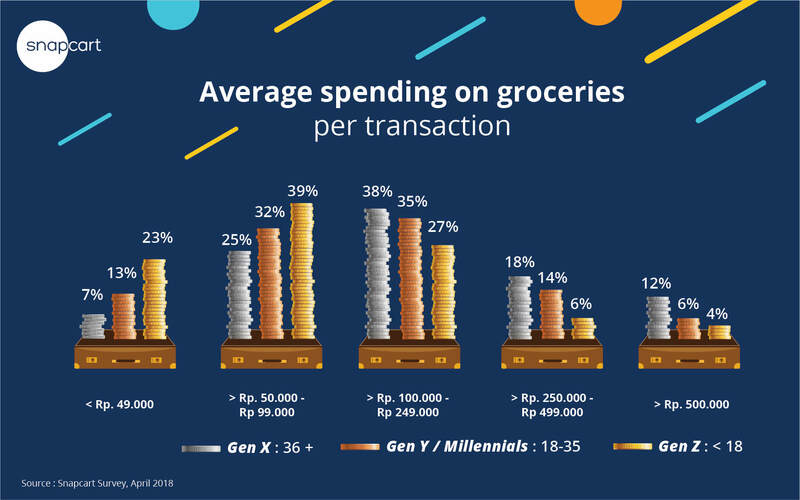 The top Gen X spenders had baskets with an average shopping value of above Rp500,000, while the majority of Gen X respondents (38%) said their average basket shopping value fell between Rp 100,000 and Rp 249,000, in comparison to the majority of Millennials, who spent between Rp 50,000 – Rp 99,000. On the other side, the Snapcart panel data shows that despite the lower average value, Millennials’ average basket size is quite They also refill their basket size more frequently than Non-Millennials, making them a potentially very valuable means target group in driving sales. The Snapcart and Marketeers survey found that across all generations surveyed, most of the consumers (more than 65%) used mobile apps to visit e-commerce sites. However, actual purchase behavior varied by age category. Fashion items, which were the most frequently purchased item by all age groups, was most popular among Gen Z shoppers. A total of 52% Gen X, 58% Millennials and 60% Gen Z respondents mentioned that they had bought fashion products while shopping online. 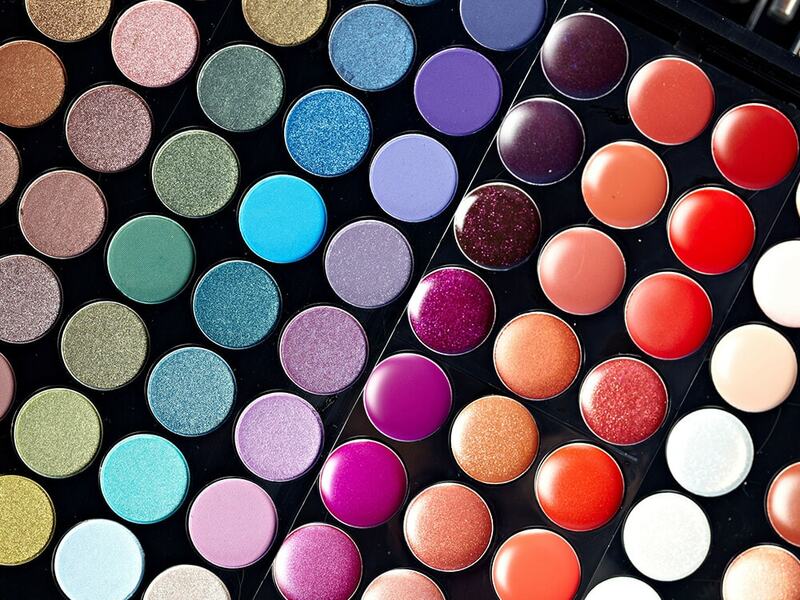 Personal care (cosmetics and body care) was second largest online purchase category, with 31% Gen X, 41% Millennials and 41% Gen Z respondents admitting to a recent purchase. Gadget purchases came third, with Gen X dominating purchases in this category, possibly due to the more expensive average price of gadgets compared with fashion purchases. In total, 35% of Gen X respondents mentioned that they had purchased a gadget online, compared with 25% of Gen Y and 23% of Gen Z respondents. 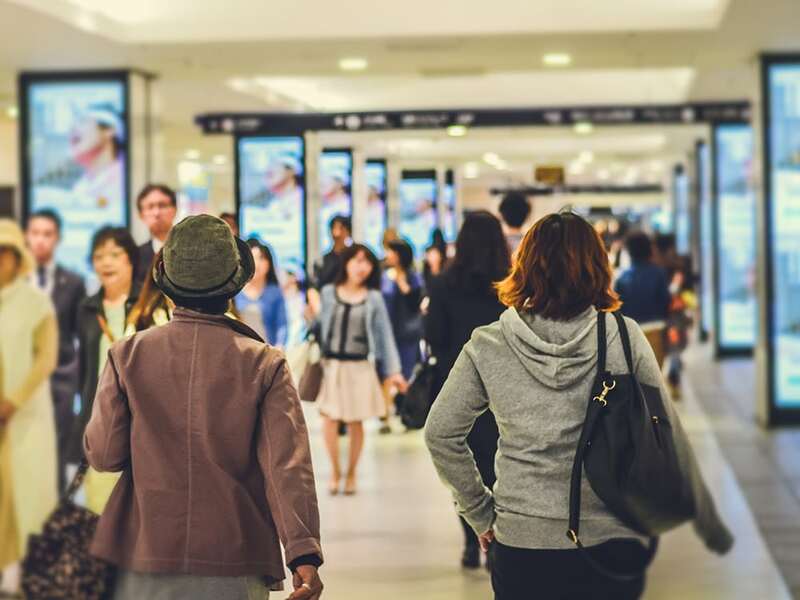 Indonesian Millennials (Gen Y) and Non-Millennials (Gen X and Gen Z) consumer show distinct shopping preferences and patterns that differentiate them. 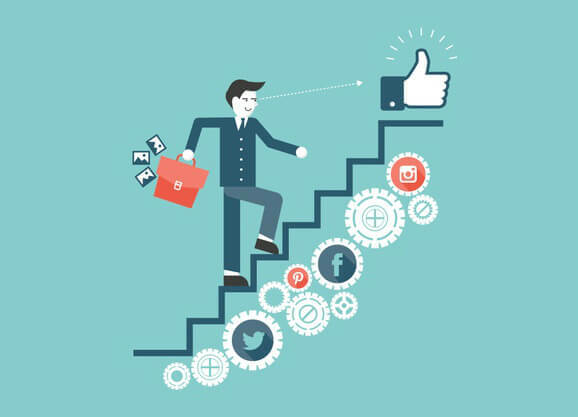 Companies should take these into account when designing marketing and distribution strategies for their products, to connect, engage and win over the spending their target spending. 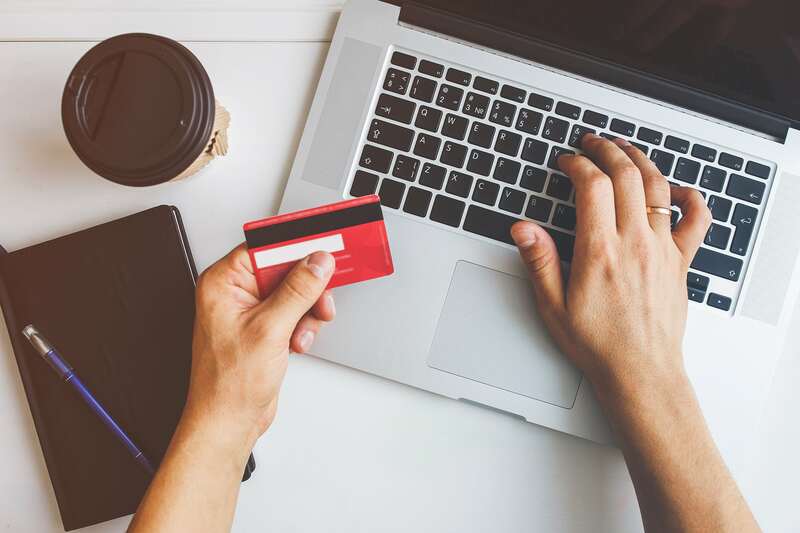 The increasing online purchase rate in all age categories is also worth noting as proof that consumers in these age categories have readily modified their behavior, and thus bears watching as their habits and behaviors continue to evolve. The Snapcart shopping receipt data captured more than 1.3 million transactions from Indonesian shoppers 18 to 35 years of age at more than 6,500 modern trade outlets comprising Hypermarkets, Supermarkets, Minimarkets, Convenience stores, Modern Health and Beauty stores and other Modern Trade independent stores across the nation, including Maluku and Papua. 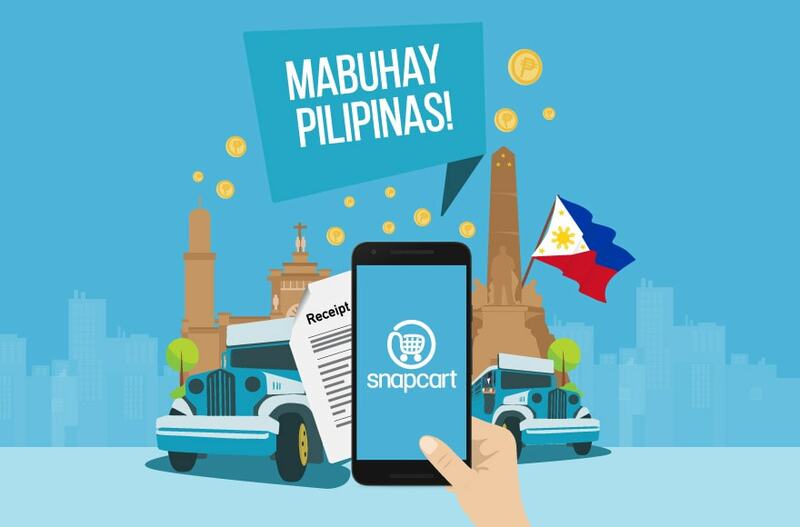 Snapcart shopping receipt data was obtained directly from registered users of the Snapcart mobile application, who uploaded receipts in turn for cashback rewards. This methodology provides a real-time snapshot of shoppers’ behavior since each receipt’s date and time is also extracted along information on the quantity and type of product bought by SKU, providing an unprecedented level of detail and accuracy into offline shopping habits. « What Comes First, Career or Family?